1973 : It is the year of an unprecedented diversification. Norman Lady, a gas carrier with Moss and Rosenberg tanks, is launched at the Stavanger shipyards for Buries Markes. 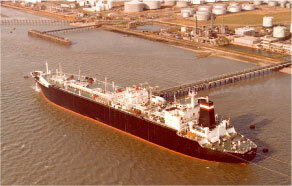 The vessel came into service in 1976 before being sold six years later to a Bermudian company. This same year, Alain LD (II) is transferred to Buries Markes and becomes La Cordillera (III). The LD fleet grew significantly when came into service the 170,414 dwt Cetra Centaurus (O/O), the 8,800 dwt alumina vessels Paul Heroult and Sainte Claire Deville, and the LPG vessels Cap Martin, Cap d’Antibes, Cap Ferrat and Providence Multina. The Gearbulk pool is also expanding rapidly. LD invests in four 39,000 dwt to be built in Japan: Louis LD (IV), Jean LD (III), Alain LD (III) and Gerard LD (III). Having five holds and two Hagglunds gantry cranes, they are sister ships to the Norwegian vessels of this pool. 1974 : In the following decade eight chemical vessels entered the Interchem fleet: La Bahia (II) and La Falda (II) in 1974, La Selva (II) et La Cumbre (II) in 1975. A year later, La Colina (II) and La Pradera (II) came into service, followed by Silver Merlin and Silver Falcon in 1983. Buries Markes orders a 39,000 dwt vessel in Japan, La Ensenada (II), equipped with 5 Hagglunds cranes and intended for the Gearbulk fleet. 1976 : To reinforce LD’s participation in Cetramar, the 74,000 dwt Cetra Norma was launched in Yugoslavia, and equipped with eight side-rolling panel hatches. 1977 : Edouard LD, a 130,000 m3 methane carrier, is launched at Dunkirk, but would have to wait four years for the Arzew liquefaction plant to come into service. She would be used on the Montoir-Algeria route and would prove to be complete success. 1978 : Three 39,000 dwt bulk carriers were delivered to Gearbulk by the Mistui-Ichahara shipyard : La Costa (II), La Cordillera (IV) and La Primavera (II). 1979 : Gearbulk calls for more investment from its partner LDA; hence the construction of Charles LD (IV) and Pierre LD (IV) in Poland, two 38,000 dwt vessels with five holds and two Hagglunds gantry cranes. Launched as the Peter in Seville in 1976, this 30,000 dwt laker (19,400 mt intake on lakes) with seven holds and four Atiensa hydraulic cranes becomes Philippe LD (III) in 1981 before being renamed La Richardais under French Kerguelen (TAAF) register. The vessel will be employed on tramping operations including but not limited to the Great Lakes. 1980 : La Loma (IV) entered the fleet as well as La Estancia (VI) and La Sierra (IV), two 39,000 dwt Polish construction vessels delivered to Gearbulk. Capo Noli joins the fleet, and will be the last vessel of the Italian branch of the Louis Dreyfus group. 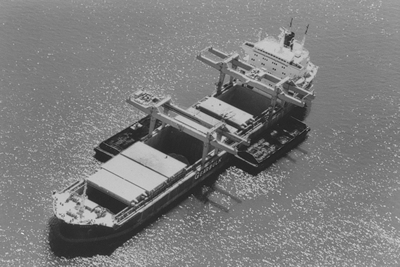 1981 : Two gearless Panamax type bulk carriers with a capacity of 77,000t dwt – La Pampa (III) and La Chacra (III), would enter the fleet respectively in 1981 and 1982.